The Feature™ MIPS starts with a low-profile shape with more coverage than traditional XC helmets, and channelled vents that radiate heat up and out when you’re climbing at lower speeds. The single-piece In-Mold shell enhances durability, yet keeps weight to a minimum. When you’re ready to drop-in, MIPS offers an additional measure of protection in certain impacts and our rugged In-Form fit system offers one-handed fit and stability adjustment. With the Feature MIPS you can dial-in the feel and focus on the trail ahead. All Giro helmets are designed to reduce as much energy as possible while meeting and exceeding stringent safety standards. The goal of Giro’s MIPS-equipped helmets is to reduce rotational forces. Giro believes that helmets equipped with this technology can reduce the amount of rotational force that may be transferred to rider’s brain in certain impacts. Learn more about MIPS in the video below. 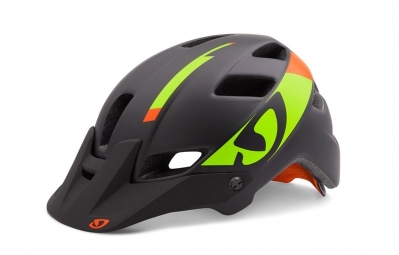 Casque GIRO FEATURE Noir vert orange mat clasificado 5.0 de 5 por 1. Rated 5 de 5 por Bold de Beau et bien J'ai acheté ce casque le moi dernier, il est bien dimensionne il est léger et tient bien sûr la tête on l'oublie.